Yandy was twice caught and arrested while attempting to defect from Cuba, each time jailed for 21 days…on the third attempt, he and friend Leandro Linares waited in tall grass until their motorized raft arrived…they set out at around 2 a.m. and arrived in the Dominican Republic at about 2 p.m. the next day…Yandy reports to have seen sharks swimming alongside the raft...Yandy calls his mother, who lives in Cuba, almost every day and is "crazy about the idea of one day going back"...Yandy is a gym rat whose muscles have been featured in Men's Journal…his favorite exercise is a tie between "all of them" and he claims not to know how much weight he lifts...He grew up admiring players like infielder José Reyes, Yoenis Céspedes and infielder Eduardo Paret-a shortstop for his hometown Villa Clara club in the Cuban National Series, for whom Díaz also played. Appeared in 39 games and made 26 starts (15DH, 6-1B, 5-3B) over two stints with the Indians… was on the active roster from June 20-23 and Aug 12 through the end of the season...Hit .407/.515/.519 (11-for-27) over his final 13 games (7 starts) of the season...In his season debut on July 20 at TEX, went 4-for-6 with 2 RBI and 2 runs in an 11-inning win…was the second 4-hit game of his career… was the first Indians player with 4 hits in his season debut since David Dellucci in 2009...On Sep 4 vs. KC, hit his first career home run, a solo shot off Jake Newberry in the 5th inning… came in the 244th plate appearance of his career, snapping the Indians longest homerless drought to begin a major league career since John McDonald in 2002...Finished the season as the International League leader with a .409 OBP…ranked 2nd with 70 BB and 6th with a .293 avg. …at the time of his last recall, was leading the IL in walks and was tied for 6th with 24 2B...POSTSEASON: Was the starting designated hitter in Game 3 of the ALDS, an 11-3 loss against the Astros…doubled in the 2nd inning off Dallas Keuchel. Split the season between Cleveland and AAA Columbus, opening the season on the Major League roster after a torrid spring training and finished the season with a strong six weeks at the Major League level...Hit .458 (22/48) in Spring Training with 2 HR and 15 RBI (1.252 OPS) and made the club out of spring training as was the club's Opening Day third baseman...Collected his first Major League hit in his third at bat of his Major League debut on April 3 at Texas, a double off Yu Darvish...Hit .236 (13/55) with 9 runs, 1 2B, 2 RBI in 15 games in his first stint before being optioned to Columbus on April 21 when Jason Kipnis returned from the D.L...Was also with Cleveland, May 8-15, going 0-for-9 in 3 games...Recalled for a third and final time on August 22 and spent the rest of the season at Major League level. Around his tenure in Cleveland, he batted .350 (108/309) in Columbus with 56 runs, 17 2B, 1 3B, 5 HR & 33 RBI in 85 games (.454/.460/.914)...At the time of August 22 recall he was leading the International League in on-base pct. (.454) and batting average and was third in OPS (.914) and tied for sixth in walks (60)... He batted .371 (33/89) off LHP and hit .321 (16/57) with runners on base..At AAA he appeared in 42 games in third, 21 games in left field, 9 games in right field and 1 game at second base. With Cleveland he made 37 starts at third base, 5 starts at DH and 3 starts in left field...Made 2 errors in 71 total chances at third base (.972)....Enjoyed a career-game on August 24 vs. Boston, going 4-for-4 with 4 runs, 2 doubles, a triple and 2 RBI (single-game bests in hits, doubles, runs)...Walked or hit safely in 35 of 45 starts...From August 24 thru the end of his season he batted .326 (28/86) with 16 runs, 7 2B, 1 3B & 10 RBI in 29 games to end the season....Over his last stint in August and September he batted .304 (28/92) with 16 runs, 7 2B, 1 3B & 10 RBI in 31 games (.407/.810)....Díaz did not draw a walk in his last 53 PA's dating back to Sept. 7...Appeared in 11 games for Caracas in the VWL (10/30) before being shutdown on Nov. 26 with groin/abdominal sorenes. Had an outstanding season in his third campaign in the Indians organization, leading the International League in on-base pct (.399) while participating in the MLB XM Futures Game in July...Was named International League Rookie of the Year following the season...Also finished among Int'l League leaders in average (2nd, .325) and OPS (3rd, .860)...Among orgnaizational leaders he finished 2nd in batting average (.318) and on-base pct. (.408) and 3rd in OPS (.854), 4th in hits (141) and tied for 5th in walks (71)... Was named an MiLB.com organizational all-star for the second straight season... Combined on the year he batted .318 (141-444) with 66 runs, 22 2B, 4 3B, 9 HR and 58 RBI in 121 games between AA Akron and AAA Columbus...Was promoted from Akron to Columbus on May 12... Reeled off a 28-game hitting streak from July 6 to August 10, the longest hitting streak in the IL since 2007 (Brandon Watson 43-games)...Combined on the year he appeared in 52 games at third base, 28 games in right field, 24 games in left field, 5 games at second base and 1 game in center field...After the season he hit .371 (56-151) in 40 games in the Venezuelan Winter League for Caracas (.451/.510/.961) ...Was second in the league in on-base and average and third in OPS (appeared in all but one game in the outfield)...Rated by Baseball America as having the best strike zone discipline in the system. August 12, 2018 Cleveland Indians recalled 3B Yandy Diaz from Columbus Clippers. July 24, 2018 Cleveland Indians optioned 3B Yandy Diaz to Columbus Clippers. July 20, 2018 Cleveland Indians recalled Yandy Diaz from Columbus Clippers. March 19, 2018 Cleveland Indians optioned 3B Yandy Diaz to Columbus Clippers. 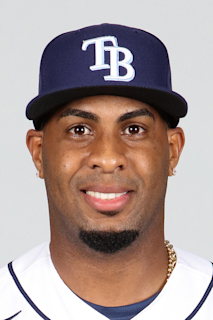 November 4, 2017 3B Yandy Diaz assigned to Leones del Caracas. October 12, 2017 Yandy Diaz roster status changed by Cleveland Indians. October 5, 2017 Cleveland Indians reassigned 3B Yandy Diaz to the minor leagues. August 22, 2017 Cleveland Indians recalled 3B Yandy Diaz from Columbus Clippers. June 26, 2017 Columbus Clippers activated 3B Yandy Diaz from the 7-day disabled list. June 16, 2017 Columbus Clippers placed 3B Yandy Diaz on the 7-day disabled list retroactive to June 14, 2017. Right quad strain. May 16, 2017 Cleveland Indians optioned 3B Yandy Diaz to Columbus Clippers. May 8, 2017 Cleveland Indians recalled Yandy Diaz from Columbus Clippers. April 21, 2017 Cleveland Indians optioned 3B Yandy Diaz to Columbus Clippers. April 2, 2017 Cleveland Indians selected the contract of Yandy Diaz from Columbus Clippers. March 31, 2017 OF Yandy Diaz assigned to Columbus Clippers. January 20, 2017 Cleveland Indians invited non-roster OF Yandy Diaz to spring training. October 2, 2016 3B Yandy Diaz assigned to Leones del Caracas. July 14, 2016 Columbus Clippers activated 3B Yandy Diaz from the temporarily inactive list. July 9, 2016 Columbus Clippers placed 3B Yandy Diaz on the temporarily inactive list. May 12, 2016 3B Yandy Diaz assigned to Columbus Clippers from Akron RubberDucks. April 5, 2016 3B Yandy Diaz assigned to Akron RubberDucks from Columbus Clippers. March 9, 2016 3B Yandy Diaz assigned to Cleveland Indians. September 3, 2015 3B Yandy Diaz assigned to Columbus Clippers from Akron RubberDucks. April 3, 2015 3B Yandy Diaz assigned to Akron RubberDucks from Lynchburg Hillcats. March 13, 2015 3B Yandy Diaz assigned to Cleveland Indians. June 5, 2014 Yandy Diaz roster status changed by Carolina Mudcats. March 31, 2014 SS Yandy Diaz assigned to Carolina Mudcats from DSL Indians. March 17, 2014 SS Yandy Diaz assigned to Cleveland Indians. February 23, 2014 SS Yandy Diaz assigned to DSL Indians. September 20, 2013 Cleveland Indians signed free agent SS Yandy Diaz to a minor league contract.